Cash in on your prose with this stylish pen, filled with recycled US currency. Cash in on your latest prose with a pen that puts your money where your memoir is. 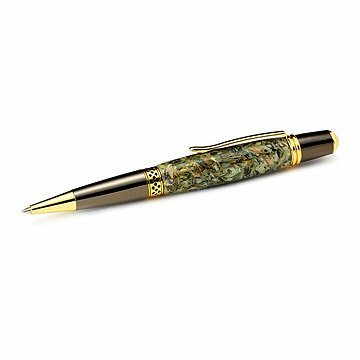 Featuring gold plated detail and a convenient stylus tip for your iPad, this handsome ballpoint is highlighted by a shredded money inlay filled with recycled US currency. Handmade by Jason Smith in Indiana. About how he got started in pen making, Jason Smith recalls, "Several years ago, after being laid-off from my job in the construction industry, my uncle brought me into his small Tennessee workshop and said "I'm gonna teach you how to make a pen." I had no idea that weekend visit to the family mountain was going to evolve into the amazing life I have today. Over the years, I've really grown as an artist, restlessly challenged myself to do better and be better - never losing sight of my commitment to provide the best service and the highest quality writing instruments and gifts possible. When refilling pens take care to pull, rather than twist, the pen apart, using the instructions provided. The Shredded Money Pen takes a Parker style ballpoint refill. A great gift to symbolize the profession of the individual that this UNCOMMON gift was purchased for. The pen collector loves this one! Despite all the unique pens he owns, this one was surprisingly well received. He has large hands so he is comfortable writing with it. It would not work for a smaller person.